One week after courageously attending this reunion, Jack passed away peacefully at his home August 19. 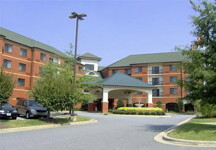 The COURTYARD MARRIOTT was selected for this years's reunion stay. It was conveniently located just off I-40 in Hickory. This upscale hotel included many amenities, including an indoor pool, exercise room and a Bistro for casual dining and drinking. Unfortunately, a breakfast buffet was not provided, a favorite for "breakfast" aficionados. Upon arrival and check-in, a hotel hospitality room was available for greetings and after-dinner chatting and refreshments. The room was reserved for us all weekend. Early evening conversations and drinking commenced, and continued with the traditional Burger and ‘Dog buffet provided adjacent to the space along with a Cash Bar. Carolyn Moretz displayed photo books from past reunions along with several composites. Larry Nixon provided Robbie Davis’s “stash” of photos from the old house and also large photos and diagrams of the new house. Larry reported that the new house would be completed this October. The new house will have 45 residents and a resident counselor. Many said that they want to attend any ceremonies in Raleigh for the opening of the new house. Old age barometer. The room had emptied out by 10:00 PM….’Nuff said. As usual, Carolyn Moretz hosted a luncheon at her home for golfers wives and non-golfer brothers. On Saturday morning, all 22 golfers met at the hotel and convoyed to Lake Hickory Country Club, to play in the traditional reunion 'Captains Choice' tournament. The winners were Team #2 at 7 under. The two runner-ups were even par. Bill Thorn & Bob Broome drove the refreshments cart. Joe Parish was the official photographer, with his chauffeur Tom O'Brien. Failure: The Thorn-Broome refreshment cart's GPS was not working, thus they did not assist Team #6 during the entire 5-hours of play. Saturday night, the group gathered at Moretz Mill, for dinner and socializing along with the usual format of recognition and entertainment. Moretz Mill is a restored building offering a classy dining and bar facility. Following the dinner of BBQ pork, chicken and all the trimmings, the usual venue. Carolyn Moretz asked for remembrance of Brothers who had passed away since our last gathering. Special mention was given to Buck and Diane Lee and Charlie and Robin Wintzer for their first reunion attendance. As is our custom and enjoyment, the group circled for singing from the SPE song books compiled several reunions ago by Jack Watson. Bill Thorn, Larry Nixon, Joel Hicks, Tom O'Brien, and Frank Furr led the singing. The highlight of entertainment was Frank Furr and his 'assembly line' routine performed as only he can (except maybe for Linda Duncan). It was agreed (with Carolyn and George approval) that our next reunion would be in two years instead of three, in August, 2020. Sadly, "our herd is thinning" at a faster rate due to our age. Sunday morning, breakfast at the hotel was enjoyed by all as different departure times were made. All agreed that it was one of our best reunions. Thanks to the Moretz’s for choosing the hotel and dinner venues and managing the arrangements. Thanks to Tom O’Brien for the promotions, solicitations and financials.